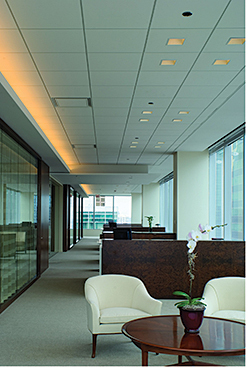 MARS ClimaPlus High-NRC Acoustical ceiling panels combine light reflectance values of .89, a noise reduction coefficient of .80 and durable surface in one panel. Made of 77 percent recycled content. A broad-spectrum standard formulation inhibits the growth of mold and mildew. Scratch-resistant surface cleans easily with a soft brush or vacuum.